ISBN 076929264X. 9x12 inches. English. Based on popular demand, Dan Coates has compiled a complete collection of great songs for all occasions to be played by the advanced piano player. 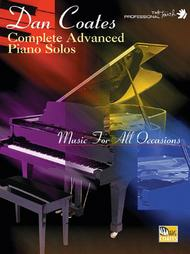 Titles include love and wedding favorites, Broadway standards, pop and country ballads, movie and TV hits and many more. This title has selections that range in difficulty from SMP Level 7-9. Separate Lives Love Theme From "White Nights"
Just right for my ability, some challenge, but that's good. Lovely music! Absolutely love this compilation of music. So fun to learn and play...So many great songs. Some are easier some are advanced and alittle bit of a challenge. waiting for it. The arrangements are beautiful and almost all have a key change into very difficult music. You can skip the more difficult page or pages and still have a complete song with a manageable intermediate arrangement. My professional pianist mentor said nothing wrong with using "White Out" to eliminate notes that your hand won't fit or your brain can't handle. I go through a lot of "White Out". I often use a blue pencil to color sharps and red to color flats. I'm 80 and need all the help I can get. and interesting and not so predictable. I love the way he makes full use of the keyboard, often changes octaves and keeps pieces flowing from start to finish. Challenging but achievable for anyone with a bit of dedication. I have enjoyed this book. The arrangements are well done. They are all playable but take a little practice to master. I've played since I was a child and play mostly classical but wanted to add some more popular pieces to my repertoire.